Long Beach City College will double its free first semester to a full year of tuition-free classes for local students as part of a significant expansion of the Long Beach College Promise, the nationally recognized program that is helping to provide better college preparation and access to thousands of students. The expansion, supported in part by a new $5 million grant from the state, was announced as part of an annual report and community celebration at LBCC last week for the Promise program. The report provides data showing steady, significant gains in college readiness and access for local students. LBUSD launched the Promise in 2008 with LBCC and Cal State Long Beach. The City of Long Beach joined the partnership last year, with a focus on preschool and internships. As part of the Promise, every LBUSD student visits LBCC and CSULB during their fourth and fifth grade years. Upon graduation from high school, students are guaranteed the free coursework at the community college, and CSULB guarantees admission to all local students who complete college admission requirements. Students and parents receive additional counseling and other support along the way. More than 500 people, including White House education officials, attended last week’s celebration event, where 25 LBUSD eighth graders received scholarships ranging from $50 to $250 for showing academic improvement. Cited by White House education leaders as a model that helped shape President Obama’s America’s College Promise initiative, the Long Beach College Promise is building a stronger community and economy as graduates become better prepared to join the workforce. Also publicly praising the Promise at the event were Michael Cohen, director of the California Department of Finance, and Former California State Sen. Darrell Steinberg, who was honored by LBUSD Superintendent Christopher J. Steinhauser with the Long Beach College Promise Champion Award for exemplary support of college and career readiness efforts including the Promise. • 49 percent of LBUSD students meet University of California and/or California State University admission requirements, an increase of 7 percent over the past four years. • LBUSD graduating seniors earned $96 million in scholarships and grants in 2015. • Expansion of high quality early childhood programs including universal access to preschool for underserved populations by 2018. • Nearly 12,000 students have received one free semester of college at LBCC. • LBCC will expand tuition-free education to one full academic year. • Of the LBUSD seniors who go on to enroll at a two-year college, 77 percent enroll at LBCC. • Four out of 10 LBUSD graduates choose to enroll at CSULB. • The Promise has increased admission and enrollment of LBUSD students to CSULB by 35 percent. • CSULB has increased six-year graduation rates to nearly 65 percent. At the city level, in 2015 Long Beach launched its Internship Challenge, an initiative to double the number of internship opportunities for students. The College Promise’s recent $5 million prize was part of California Gov. Jerry Brown’s Awards for Innovation in Higher Education. The Promise program achieved the highest score among the state’s applicants. Funding from the award will be used to expand and enhance the Promise by using new technology to improve counseling and guidance for students at all of the institutions, reducing remediation through the use of additional interventions during high school, strengthening efforts to build career pathways among the partner institutions, and closing achievement gaps by expanding opportunities for students in the city’s underserved communities. 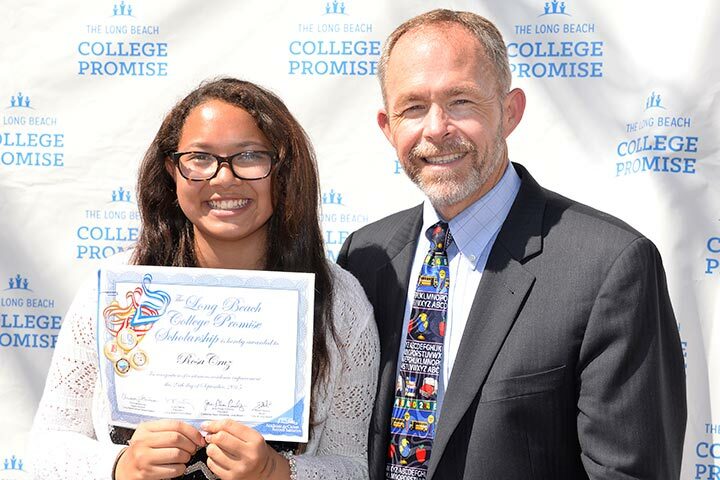 Robinson K-8 School student Rosa Cruz, joined here by LBUSD Superintendent Christopher J. Steinhauser, was one of 25 local eighth graders to receive scholarships of up to $250 during a recent College Promise celebration at LBCC.